The ‘Spring Mix’ Green Manure is a specially formulated blend suitable for sowing in early spring and for 'digging in' in early Summer. 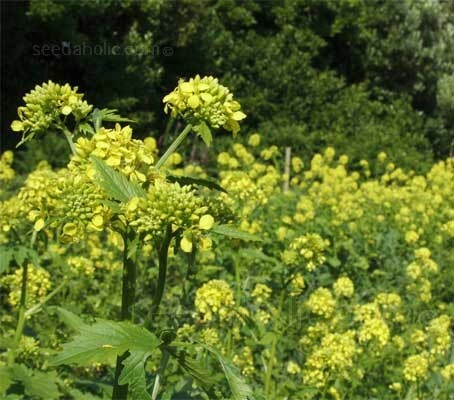 It uses a fast growing blend of Mustard and Tares, which is ideal for adding organic matter, fixing nitrogen and suppressing weeds. The mix is designed for maximum germination at low temperatures. The mustard is quick growing and can be sown from March to September for a period of 2 to 4 months. It is quick growing, suits most soils and develops a high level of green matter and fibre. Excellent for soils lacking organic matter, helping to improve soil texture and give better moisture retention. Commonly known as 'Tares', this leafy plant makes an ideal green manure. It adds organic matter, aiding soil fertility and fixes nitrogen, hugely benefiting the growth of your follow on crops. Ans while its working its magic on your soil, it suppresses weed growth leaving you with a clean, fertile bed. Rye is one of the best manures for winter use, as it gives good crop cover to help prevent nutrient leaching. It is a hardy annual and an excellent nitrogen lifter and it can lift and release up to 90% of nitrate to the next crop. Rye has deep penetrative roots that help to break up heavy soils and so improve soil structure. When planted in the winter, it actually grows during any warmer days, when sunlight temporarily brings the plant to above freezing, even while there is still general snow cover. It is sometimes used in winter gardens and is a very common nurse crop. Prepare the soil by removing weeds, digging over if it hasn't been recently cultivated and raking level. Scatter seeds over the surface of the soil. Make sure the seed is in firm contact with the soil by gently tapping over the surface with the back of a spade. Water in well. Bare patches should be covered within two to three weeks and plants will do the most good if they are left for around eight weeks before digging in. If plants start to flower before this, cut off the tops and dig in. Leave the green manure to decompose in the soil for up to four weeks before growing vegetables. There's something about growing cover crops makes a person feel like a farmer. Just the sowing of a few handfuls of the green manure seed and its digging in with the most basic of tools, a spade and old fashioned elbow grease!